“When I see my former classmates whom I used to defeat in class driving vehicles and living large, I regret why I started using drugs and dropped off school.” Says Michael who is a recovering drug addict. 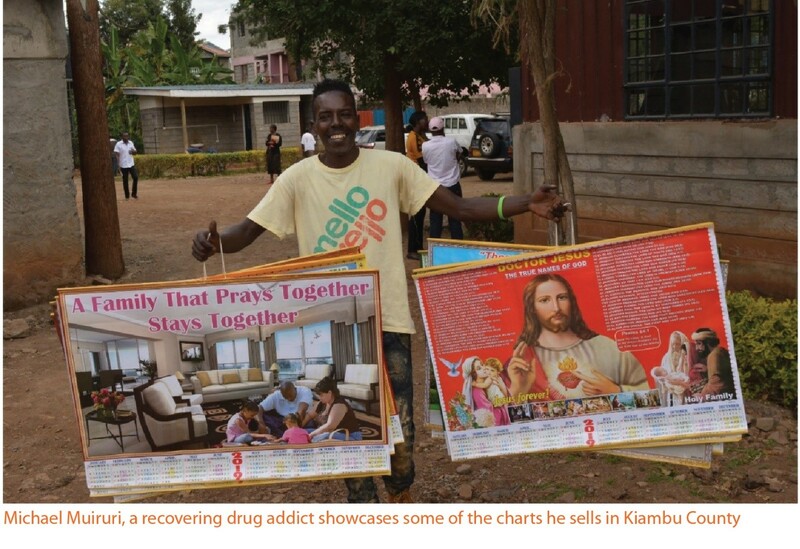 34 year old Michael Muiruri is among the 255 recovering drug addicts enrolled in the LVCT Health led Daraja project, which offers HIV prevention interventions to people who inject drugs in Kiambu. He enrolled in the project in 2017 and has been adhering well to the treatment and is on the road to full recovery. He lives with his grandmother and dropped out of school in his third year of secondary school due to peer pressure. “I left school and got into the public transport industry where I was in charge of a bus stop, I later moved to Nairobi where I was introduced and addicted to drugs. I was soon into crime to sustain my drug addiction and this led to me surviving a number of mob beatings and frequent visits to police cells.” Recalls Michael. After 2 years of city life and drug addiction, Michael was rescued by his aunt who took him for rehabilitation. When he left rehab after 3 months, he relapsed, and was soon back into crime. After being kicked out of his home and community and back in the drug dens of Kiambu. LVCT Health later partnered with the church and offered to give HIV prevention measures like needles and syringes for the injecting drug users and invited their parents/guardians into a reconciliation process in readiness for induction into Medically Assisted Therapy (MAT). Michael was among the first group of addicts that were enrolled into the drug addiction Methadone treatment program. The group is first taken through a counselling process, where they go through a five day induction process, culminating in a day with their parents/guardians who agree to accept them back home and support them for the initial days when they have to go to the MAT clinic in Ngara, Nairobi for their daily methadone dose. Michael began a hawking business and this made his visit to the clinic worthwhile as he would use the opportunity to go to the market and stock up his business. He sells education and decoration charts. He has since been able to save and buy 4 handcarts and employ 4 people, including his uncle. He hires them out to construction sites for ferrying construction materials and fetching water earning between 500-1000 shillings every day. In addition, Michael makes a profit of between 500 – 1500 shillings every day from his hawking business, money that enables him to access the methadone clinic in Ngara daily and cater for his livelihood. “I bought the hand carts in Gikomba market after discovering that they were useful in carrying goods in my home town, I had made some good savings from my hawking business and since I bought the first one, I have never looked back and can now boast of being a boss.” Says a jovial Michael. Michael has been on methadone treatment for one year and two months, his wish is to be a successful businessman and encourage his peers against drug use and addiction. Most of the addicts in the project have started small income generating activities, which helps improve their livelihood and gain acceptance back into their communities.